The Old Abbey Taphouse re-opened in October 2016 as a STEAM (that's Science Technology Engineering Arts and Maths) focused hub in a pub connecting communities through events and creating networks between academics, residents and local businesses. Our team strives to serve the community using our knowledge in events and academia and our connections to the Hulme area. We are DIY people with a back ground in history, geography, co-operatives, music and the arts. A few highlights of our first year were hosting a BBQ for Reel Mcr - which brought together all the local residents who used to live next to the pub in the Greenheys Estate, working with Hulme Community Garden to put on a family festival, 10 STEAM events culminating in a STEAM Maker's led by Dr Jana Wendler, having a class full of local school children down to help us plant our garden and lots of lots of Live Music. Upstairs we completed the rehearsal room, recording studio and meeting room space. This would not have been possible without the support of the University of Manchester and Manchester Science Partnerships. In our second year we focused on developing the garden area with an outdoor space. We received funding from Once Mcr which helped us to purchase a stretch tent and build a stage meaning we could host larger events. Highlights of 2018 include joining up with local Social Enterprise Cracking Good Food, the NHS and local practitioners to host a Memorial Day for Dr Bernadette Tynan and raise awareness about Endometrial Cancer, regularly working with Gaskell Garden Project to help fund raise for legal fees to support Asylum Seekers, facilitating resident led events such as the Punk Rock Choir and hosting archeologist John Piparani monthly hands on making sessions about prehistoric artifacts such as Iron Age Arrowheads. We feel really supported by our local community and proud to serve Hulme and Moss Side. For our efforts we were awarded Making a Difference Award - Highly Commended for Outstanding Community Engagement by the University of Manchester and have been shortlisted in the last five for Outstanding Innovation in the Manchester City Council Culture Awards (of which we find out on Nov 14th 2018). We have an exciting menu that offers something for everyone. We specialise in making real Italian Style Stone Baked Pizza. Our pizza dough recipe follows authentic Italian methods. We use the finest Italian Pizza dough which we hand-knead and then proof for 3 hours. We want to cater to as many tastes as possible - hence we offer the option to make all our pizzas Vegan. For those Gluten-Intolerant we make a really good fresh Salads and Soups which are prepared in a separate area to the pizzas. We deliver our hand-made stone baked pizzas to the local area. 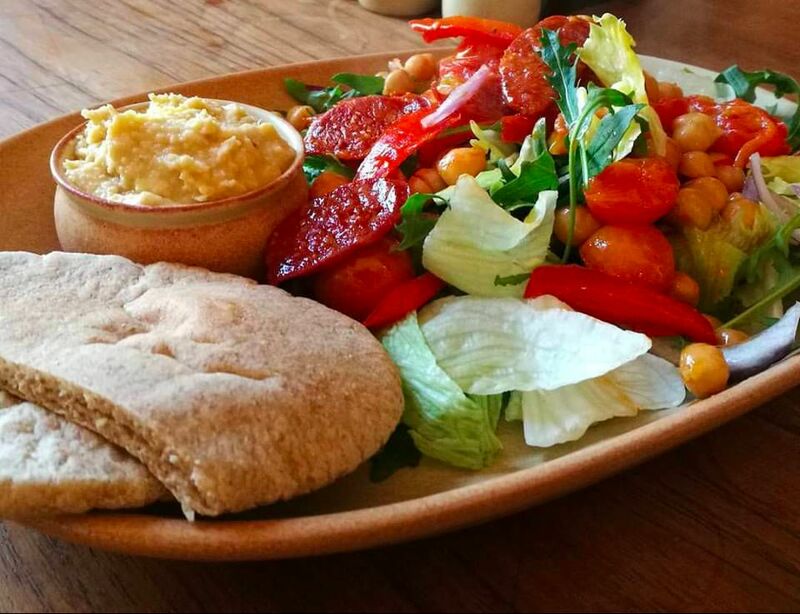 We offer Vegan, Veggie and Meat options - meaning everyone can eat together! Order online now by clicking our menu above. We use Electric Bikes to do the deliveries and use Biodegradeable Plastic Cups and Straws for our milkshakes and Smoothies. We have a wide selection of Vegan Icecreams sourced from Gold's of Wigans. We offer catering on and off-site. Our buffets offer a mixture of Mediterranean and Italian classics served alongside Pizzas. We can cater for most budgets so why not drop us an email. We also do a great Caribbean BBQ. Or if there is something else you had in mind our chefs have extensive experience in Vegan & Meat dishes and are always up for making something a bit more out of the ordinary! We have a really wide and varied selection of events on every week. Wether you fancy playing some board games, getting involved in a jam or learning how to make wine! You will be redirected to our Facebook.